[Fig. 17] Going back at least 4,500 years, humans have prized Sapelo Island for its generous game, rich marshes, lush woodlands, and beautiful beaches. Man has used it for many things, including Indian hunting grounds, Spanish missions, French asylum, slave-supported cotton and sugar plantations, a navigational landmark, a millionaires' playground, and finally, a scientific research center and a state-owned wildlife preserve. These phases of Sapelo's history and the island's abundant natural resources are on display to travelers who buy a tour ticket and ride a ferry from the mainland, or have received an invitation from a resident on the island. Larger than Bermuda, Sapelo is Georgia's fourth largest island at 10 miles long and 4 miles wide, and it retains many natural features despite its long history of human activities and its resident population. Doboy Sound is located off its southern tip, and the Duplin River separates it from the mainland to the west. Sapelo Sound is located off its northern end, and the tidal river Blackbeard Creek and Blackbeard Island protect the island's northeast flank. By state law, all of Georgia's barrier island beaches are state property and open to the public. 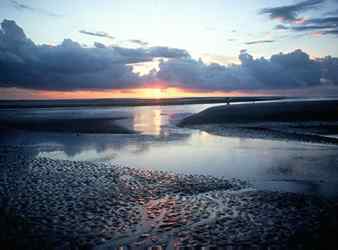 The public is allowed to use Sapelo's beaches for hiking, picnicking, or shelling during daylight hours. However, the interior of the island is off-limits to the public without permission. Located 60 miles south of Savannah opposite McIntosh County's mainland, Sapelo has four active components: the University of Georgia's Marine Institute, the Sapelo Island National Estuarine Research Reserve, the R.J. Reynolds (Sapelo Island) Wildlife Refuge, and the Hog Hammock Community. The four entities divide the 17,950-acre island (10,900 acres of uplands and 5.5 miles of beach) into different uses. Headquartered at the southern end is the UGA Marine Institute [Fig. 17(7)], which conducts important research in marsh ecology and barrier island formation, established in 1953 through the invitation of R.J. Reynolds. (Reynolds was the multimillionaire owner of Reynolds Tobacco Company who owned Sapelo Island from 1934 until his death in 1964.) Most of the credit for the creation of the Marine Institute goes to Dr. Eugene P. Odum, acknowledged as the "father of ecology" and a personal friend of Reynolds. Dr. Odum led pioneering research into the mysterious relationship between the salt marsh and marine life (see University of Georgia's Skidaway Institute of Oceanography and Marine Extension Center). In 1969, the widow of tobacco millionaire R.J. Reynolds, Annemarie Schmidt Reynolds, sold 8,240 acres of the island to the state, which became the R.J. Reynolds (Sapelo Island) Wildlife Refuge [Fig. 17(8)], managed by the state for deer and wild turkey as well as pine production. In 1976, the southern portion of the island along with Little Sapelo Island and the tidal marsh around the Duplin River was acquired by the state and designated a National Estuarine Research Reserve by the National Oceanic and Atmospheric Administration (NOAA). The 7,400 acres became the second estuarine sanctuary established and today is one of 22 research reserves on the nation's coastlines. Its purpose is research and education about coastal resources. The fourth part is 434-acre Hog Hammock, a privately owned community. Hog Hammock's 75 residents are descendants of the 400 slaves who lived on Thomas Spalding's Sapelo plantation in the early nineteenth century. The Gullah village, with its unique cultural, artistic, and linguistic traditions, is without a doubt the most unusual community in Georgia. Old timers speak geechee, a colorful creole that blends English with a number of African languages, primarily from the western coast. Hog Hammock was created in the early 1940s when R.J. Reynolds, who owned most of the island, consolidated the scattered black land holdings around the island. Blacks exchanged their holdings in Raccoon Bluff, Shell Hammock, and other communities for property and small houses with indoor plumbing in Hog Hammock. Access to the island is controlled. Residents of Hog Hammock, state employees, and researchers with the Marine Institute are free to come and go as they please. 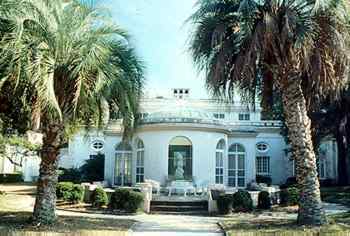 The general public must buy a tour ticket that includes transportation to and from the island from the Visitors Interpretive Center (phone 912-437-3224) near Meridian, transportation on the island, and a guided tour of the island and historic mansions. Another option is to wrangle an invitation from residents, some of whom offer commercial lodging on the island. The tour conducted by Sapelo Island NERR staff includes a marsh walk, a beach walk, and a tour of Hog Hammock, Reynolds Mansion, and other historic ruins on the island. The island's natural assets have been well documented by researchers, with the older Pleistocene uplands dating back 25,000 to 36,000 years, while the seaward portions date back 5,000 years. (Approximately 10 percent of Sapelo is Holocene.) The tour leads visitors past plants of the salt marsh, including Spartina, needlerush, sea oxeye, and glasswort. All of the lush marsh surrounding the Duplin River to the west of the island is protected by the Sapelo Island National Estuarine Sanctuary. Salt marsh on the island's northeastern shoulder surrounding Blackbeard Creek is protected as a national wilderness. Pioneering scientific research conducted here has revealed the critical importance of the salt marsh ecosystem as provider of basic nutrients to young marine creatures as the tides pulse and wash nutrients twice daily through the estuary and out into the sounds. From the edge of the marsh to higher, drier ground, one will see red cedar, marsh elder, groundsel-tree, and yaupon. Maritime forests, identified by a distinct canopy, vary from live oak and palmetto communities, to American holly and laurel oak hardwoods, and pine forests consisting of longleaf, loblolly, slash, and pond pine. Neotropical migrants visit the dense forests, and found nesting here are yellow-throated warblers, parulas, and painted buntings that nest in the oak woodlands in summer. Some young cypresses are re-establishing themselves after significant drainage activities from nineteenth century owners of the island killed the water-loving older trees. Mono-culture pine forests are found in some sections where the island is managed for timber production. An artificial fresh-water pond on the north end of the island supports a noisy rookery of egrets and herons in spring and summer and waterfowl during winter migrations. Alligators are found in the pond, along with southern bullfrogs and leopard frogs and other freshwater-loving reptiles and amphibians. Bottomland hardwoods such as maples and sweetgum are found near freshwater drainage ditches and sloughs between dune ridges, which serve as breeding sites for frogs and toads, including the green, squirrel, and pine woods treefrogs, and southern and narrow-mouth toads. Eastern diamondback rattlesnakes are found on the island, as are cottonmouths, corn snakes, garter snakes, and kingsnakes. The most common lizard on the island is the green anole. Interdune meadows of wax myrtle, Spanish bayonet, morning glory, butterfly pea, sea oats, Andropogan sp., dune meadow grass (Spartina patens), and camphorweed trap, hold, and use the drifting sands of Sapelo's beach. At the shore, many shells can be found such as the impressively large shed exoskeletons of horseshoe crabs, cockles, whelks, sand dollars, cochina, angel wings, and brown lumps called sea pork. Many species of birds feed and rest near the water's edge, such as gulls, terns, skimmers, and pipers. More than 225 bird species are known to visit or live on the island, which makes a bird handbook a useful companion to visitors. Sapelo is also an important nesting site for threatened loggerhead sea turtles. An average of 50 sea turtles a year crawl Nannygoat and Cabretta beaches during summer to lay their eggs. Sapelo's history is as colorful as its wildlife. Hundreds of shell middens and a shell ring 12 feet high and 300 feet in diameter give silent testimony to the importance of the island to Paleo-Indians, who used it as a hunting and fishing ground [Fig. 17(2)]. Here archeologists have found pottery shards that date back 4,500 years, making them some of the oldest artifacts ever found in the New World. Later, the Guale Indians had several settlements located on the island, including a 158-acre village at Kenan Field. The island's modern name is derived from a Guale village named Sapala on the northern side of the island. During the Spanish mission period on the Georgia coast from 1573 to 1684, missionaries were very active on and around the island, which supported a mission and garrison called San Joseph de Sapala, where a large plantation grew oranges, figs, peaches, artichokes, and onions. Some archeologists believe the lost mission of Ayllón of 1526 is located near Sapelo or on the mainland. Sapelo was one of the three Hunting Islands reserved by the Indians when Oglethorpe settled Savannah, and it eventually passed into white hands. Plantations existed here leading up to the Revolutionary War, when British raiders seized slaves and valuables on the island. After the American Revolution, Sapelo was purchased by French Royalists who fled the French Revolution and landed here in 1789. They built a mansion called "Chocolate" [Fig. 17(3)] by their slaves, which today lies in ruins. One of the French noblemen was Christopher Poulain du Bignon, who later owned Jekyll Island. The noblemen planned on raising and selling slaves, but they quarreled among themselves and the scheme failed. After the French, three wealthy businessmen owned and left their mark on the island. The first, the industrious Thomas Spalding, owned Sapelo from 18021851, and significantly changed the island with his various agricultural activities, including timbering and cultivation of sugar cane, rice, and sea island cotton. Spalding's slaves dug huge ditches and levees to drain the soil to make the island more suitable for agriculture. Spalding, a statesman and writer, was considered an agrarian genius. He practiced crop rotation, was one of the first to grow sea island cotton, and was considered the father of the Georgia sugar industry. He engineered a tide-powered mill and constructed a huge mansion at the south end of the island out of tabby. He was widely criticized for his benevolent treatment of his slaves. Each family had its own house built of tabby, and plots of land for gardens, and worked the fields much as tenant farmers. None were sold from the plantation during Spalding's lifetime. On the mainland, Spalding established the Bank of Darien and Ashantilly, his winter home where he was buried with his wife in 1851. The plantation passed down to his grandson, but Spalding's descendants could not continue his success. Confederates troops were briefly stationed on the island, and during the Civil War and Reconstruction the island fell into ruin. The second millionaire to own the island was business visionary Howard Coffin, a Detroit automobile pioneer of Hudson Motors fame who purchased most of the island in 1912. He rebuilt the South End Mansion, building on top of the 100-year-old foundations an opulent mansion with indoor and outdoor swimming pools, Italian statuary, and a recreation room and lounge on the basement level. The mansion used Spalding's floorplan, but followed a Spanish-Mediterranean style, today seen at The Cloister on Sea Island, another Coffin development. Coffin was visited by President Calvin Coolidge, President Herbert Hoover, and aviator Charles A. Lindbergh, who landed his plane on the island. Helping to manage the island was Coffin's young cousin Alfred W. (Bill) Jones Sr. Coffin and Jones drained and diked Sapelo's swamps, raised beef and dairy cattle, cut timber from the island's forests, and established an oyster and shrimp cannery on the island. Their influence in the area can't be understated, with projects affecting the marshes, Blackbeard, Wolf, St. Catherines, and St. Simons islands, and Darien and St. Marys. They managed a fleet of 27 boats and barges, including the luxury yacht Zapala. Coffin began scientific oyster farming, which produced prolific oyster beds but attracted poachers. He sponsored government research in Central America that brought to the island the Guatemalan chachalaca, and bred pheasants and wild turkeys. St. Simons Island. The stock market crash of 1929 and Great Depression resulted in the financial and emotional ruin of Coffin, who sold Sapelo to tobacco king R.J. Reynolds in 1934, in order to keep the Sea Island Company solvent. Coffin died from a self-inflicted gunshot wound in 1937. R.J. Reynolds owned the island until his death of smoking-caused emphysema in 1964. During his tenure, he modernized the house and hired the well-known wildlife artist and muralist Athos Menaboni, who painted images of tropical birds, animals, and pirates on the walls of the solarium and other parts of the house. His most enduring legacy was the creation of the Sapelo Island Research Foundation in 1949, which led to the creation of the University of Georgia's Marine Institute in 1954, located in the south end dairy complex of buildings. Reynolds was a colorful character and popular with McIntosh county citizens, who benefited from his many charitable gifts to the community. 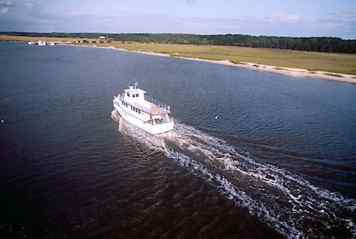 Directions: Sapelo Island is reached by a 30-minute ferry ride. The Sapelo ferry dock and Visitor Interpretive Center are located in Meridian, 8 miles northeast of Darien, off of GA 99. From Interstate 95 south to Exit 11/58, go left onto GA 99 and follow the road 9.1 miles to Landing Road. Turn left onto Landing Road (a church is on the corner) and follow the road to the visitor center. Activities: Historic and nature touring, lighthouse touring, bird-watching, shelling, nature studies, pioneer camping, group tours, group lodging. Controlled hunting of deer, turkey, dove, raccoon, and small game is offered yearly. Contact the Wildlife Resources Division, Georgia Department of Natural Resources, 1 Conservation Way, Brunswick, GA 31520. Phone (912) 262-3173. Facilities: Dock, restrooms, historic mansion and ruins, meeting facilities. Reynolds Mansion Lodging: group accommodations for conferences, workshops and retreats for up to 29 people. Minimum 2 nights, 14 people. Rates include 3 meals per day, meeting facilities and transportation. Phone (912) 485-2299. Pioneer Camping: Groups may camp near the beach on Sapelo's Cabretta Island. Minimum 2 nights for up to 25 persons. Comfort station with hot showers available. Phone (912) 485-2299. Parties interested in group tours should phone (912) 485-2251. Hog Hammock: The Weekender. Phone (912) 485-2277. Fees: Ferry tickets are $10 for adults and $6 for children ages 618, and free for anyone age 5 and younger. Dates: Guided tours are offered Sept. through May: Wednesday 8:30 a.m.12:30 p.m. and Saturday 9 a.m.1 p.m. From June through August, an additional tour is offered Friday 8:30 a.m.12:30 p.m. Extended tour: last Tuesday of each month, March through October, 8:303:00. Reservations are required. Phone (912) 437-3224. Island is closed two weeks annually for deer hunts in fall and winter. Portions of beach may be closed to prevent disturbance to nesting, wintering, or migrating birds. For more information: Sapelo Island National Estuarine Research Reserve, PO Box 15, Sapelo Island, GA 31327. Phone (912) 485-2251. [Fig. 17(4)] Handsome Sapelo Lighthouse is one of Georgia's five lighthouses still in existence, and one of three open to the general public. The striking red and white stripes on the 170-year-old lighthouse make it a dramatic landmark on the southern end of Sapelo Island. Abandoned for 93 years, restoration of the lighthouse became a goal of the Department of Natural Resources, which eventually led an 8-month, $490,000 effort to repair and preserve the lighthouse. It was undertaken in 1998, resulting in a new spiral staircase, restoration of the brick and stucco exterior, a fresh coat of red and white paint, and a new electric beacon that will signal boaters 12 miles offshore. The lighthouse complex includes the remains of a brick oil house and a cistern. Roughly 600 feet east of the main tower is an iron range beacon built in 1877. Visitors interested in touring the lighthouse must book a ride on the Sapelo Island Ferry, which includes a guided tour. The lighthouse's history began in 1808, when Thomas Spalding sold 5 acres of land on Sapelo's south end for $1 to the U.S. Government to build a lighthouse to help guide shipping into the growing port of Darien. An 80-foot tower was completed in 1820, built by Winslow Lewis of Boston, at a cost of $14,500. The 65-foot, round brick tower, with a 25-foot diameter base tapering to 12 feet, was topped by a 15-foot iron lantern containing reflectors lit with whale oil. Seventy-nine cypress steps spiraled the interior of the tower to the cupola. Several keepers served at the lighthouse during the antebellum years. The lighthouse was ravaged by a hurricane in 1824, but was put back into operation until 1854, when it was upgraded with a fourth order Fresnel lens. When Confederate forces abandoned the island in 1862, they removed this lens as part of a strategy to hinder the Union blockade. From 18621865, Union forces used the lighthouse as an observation post during their blockade of Sapelo, Doboy, and Altamaha sounds. After the Civil War, the lighthouse was repaired and reactivated by the U.S. Lighthouse Service in 1868, and the signature red and white daymark was painted on the exterior. In 1873, Irishman James Cromley was appointed head keeper of Sapelo Light, which started a 60-year tradition of Cromleys in charge of lighthouse operations on the island. The hurricane and "tidal wave" of 1898 put much of the island under water, and severely damaged the lighthouse's foundation. Cromley's son William was keeper of the lighthouse during the hurricane and was saved by "a colored man" who tied the unconscious keeper to a boat. (His brother, James, was keeper of Wolf Beacon Light. See Wolf Island National Wildlife Refuge) A new lighthouse was ordered and in 1905, a 100-foot steel pyramid tower was built a few hundred feet north of the brick tower, taking over navigational responsibilities from the 1820 tower. The steel tower was deactivated in 1933 due to a decline of shipping in Darien, and the tower was dismantled and shipped to South Fox Island in Lake Michigan in 1934. The support buildings were also taken down. Located nearby, however, are the concrete foundations of a U.S. Army artillery emplacement constructed in 1898 as part of the coastal defense system during the Spanish-American War. [Fig. 17(6)] Undoubtedly, this is the hardest attraction to visit on the Georgia coast, because it is located 17.5 nautical miles east of Sapelo Island and 60 feet below the surface of the ocean. However, the 17-square mile sanctuary is very important to the understanding and health of the Georgia coast. Also called Sapelo Live Bottom, this natural reef formation provides an important home and feeding grounds for many marine species that would otherwise struggle in the barren, sandy bottom that makes up the majority of Georgia's coastal shelf. Gray's Reef is a popular site for fishing, scuba diving, scientific research, and marine education. Sport fishermen are well aware of how beneficial underwater "structure" is to fish species, whether it is a submerged homesite at Lake Lanier or a rock outcropping off Georgia's coast. They know fish use these structures as shelter, feeding sites, and places to raise their young, and that is why fishermen use sonar devices to locate underwater "reefs," because that's where the fish are. Conservation organizations that support sport-fishing, such as Atlantic Coast Conservation Association, promote the creation of offshore artificial reefs that help saltwater species. Some activities include the sinking of old bridges, tug boats, liberty ships, and military equipment to create new fishing hot spots. At Gray's Reef, the extruded limestone provides a base to which sponges, hard and soft corals, tunicates, hydroids, and other invertebrates can attach. These, in turn, support a myriad of more mobile creatures, such as sea cucumbers, urchins, sea stars, brittle stars, snails, crabs, snapping shrimp, squid, octopus, lobsters, and moray eels. Feeding on this "live bottom" are many fish species, including colorful tropical fish such as damsels, wrasses, butterflies, and angels, as well as popular game fish such as snappers, king mackerel, amberjacks, sharks, barracudas, and giant manta rays. Species counts during spring and fall have revealed that the reef is visited by more than 45 fish species, including the leopard toadfish, checkered blenny, red and longspine porgy, cowfish, gag grouper, red goatfish, spottail pinfish, belted sandfish, and black sea bass. Threatened loggerhead sea turtles forage and rest at the reef, and the waters are also used as winter calving grounds for the endangered right whale. Divers accustomed to the clear blue waters of tropical reefs may be disappointed by the lack of clarity of Gray's Reef, but the quantity and variety of marine life here rivals or surpasses that of coral reefs. The reef was created from sandy, calcereous mud deposited during the Pliocene Epoch between 2 and 5 million years ago. In the following Pleistocene Epoch, sea levels rose and fell as a response to global changes in climate and the earth's ice sheet. At one time, the reef was an exposed, terrestrial environment subjected to processes of weathering, erosion, and lithification. It is now a submerged geologic feature, with ledges approximately 10 feet high (the highest is 22 feet) with caves and sandy troughs between. The National Marine Sanctuary Program was created by congressional act in 1972, in order to promote comprehensive management of sensitive marine areas. Twelve sanctuaries have been established totaling 18,000 square miles, ranging from the 3,696 square miles of the Florida Keys National Marine Sanctuary to the less than 1-square-mile Monitor National Marine Sanctuary. Gray's Reef was designated in 1981 and is one of the largest near-shore live bottoms off the southeastern United States. The reef was named in honor of the late Milton Gray, a pioneer in live bottom research at the University of Georgia's Sapelo Marine Institute. In 1986, UNESCO recognized the sanctuary as an international biosphere reserve. Gray's Reef is under the jurisdiction of the National Oceanic and Atmospheric Administration (NOAA). NOAA provides education and interpretive programs at the Marine Extension Center of the University of Georgia at Skidaway (see University of Georgia's Skidaway Institute of Oceanography and Marine Extension Center). Regulations at the sanctuary prohibit the following activities: use of wire fish traps and poisons; setting electric charges, powerheads, or other explosives, or similar methods to take any marine animal or plant; using bottom trawls, specimen dredges, or similar vessel-towed bottom sampling devices; taking or damaging any bottom formation, marine invertebrate, marine plant, or tropical fish; depositing or discharging any polluting material, except fish or fish parts, baits, chumming materials, vessel cooling waters, and effluent from approved marine sanitation devices. Directions: Gray's Reef is found on NOAA chart 11509. Buoy at 31 degrees 24.00´ N, 80 degrees 52.14´ W. Those wishing to fish at Gray's Reef must be aware of federal sanctuary regulations and use their private watercraft or an experienced charter service from a local marina. It is recommended that scuba divers travel with skilled dive charters who can provide experienced advice. For more information: Gray's Reef National Marine Sanctuary, 10 Ocean Science Circle, Savannah, GA 31411. Phone (912) 598-2345.